By cash or cheque. Cheques should be made payable to Bassetlaw Hospice. 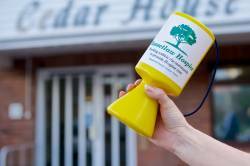 You can donate in person by calling into the Appeal Office, 4 Jubilee Courtyard, Retford, DN22 6BN. Everyone should have a Will, whatever the size of your estate. It is the only way you can be sure that your wishes are fulfilled after your death. When you have made sure your family and loved ones are provided for, you could think about leaving a legacy to Bassetlaw Hospice. This is a very special way of making sure our services can be continued in the future. It is easy to make or change a Will. You can legally write your own but it is recommended that you use a solicitor. Always keep your Will up to date, especially if there are major changes to your circumstances. If you would like further information on leaving a legacy to Bassetlaw Hospice please contact the Hospice on 01777 863270. Copyright © Bassetlaw Hospice, 2015-2019. Registered Charity Number 701876. All Rights Reserved.